Analysis – Being able to type the address of a website is one of the most essential features we expect from web browsers today. Yet it is the URL bar and its purpose that is now being reconsidered by both Google as well as Mozilla for Chrome and Firefox. The next major revision of web browsers will include options to hide the URL bar. Further down the road, it is inevitable that the URL bar will become what it is supposed to be: A tool – not more and not less. Chrome has always been a minimalistic web browser that may not have hit the general taste back in 2008 when it was first released. By mid of 2010, however, Google had taken a closer look at the Chrome UI and improved the menu bar beginning with Chrome 6. Google trimmed unnecessary features and merged buttons to save space and give web content more room. Both Mozilla and Microsoft followed an apparent trend and flaunts reduced interfaces designed for a new Internet era that gives web content the priority. In this rivalry, every pixel counts, and we may be seeing the most dramatic change to web browsers since their invention in 1993. Mosaic, the web browser that is generally credited with bringing web content to the masses, was released more than 18 years ago by scientists at NCSA. 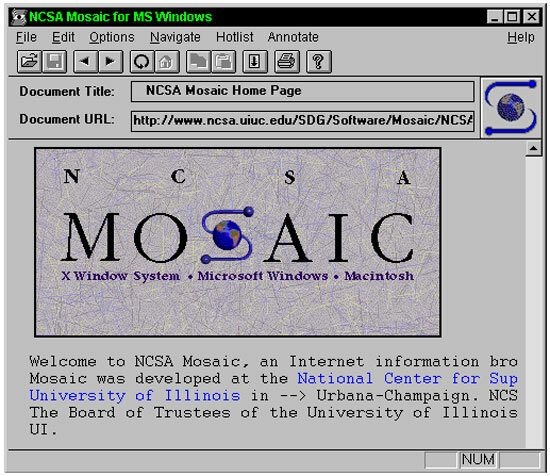 The original Mosaic was a revolutionary application that gave Internet content a mainstream GUI and was ergonomically designed, as far as the Windows environment of the early 1990s allowed. Back then and until recently, the browser’s main purpose was navigation. In fact, the original Mosaic browser had two URL bars – sort of. The first field was reserved to display the document title. The second was the URL bar as we know it and it is one of just a handful of other elements of the original UI that survived until today. The hidden URL bar in Chrome may not be the best design possible. Occasionally you do want to know the URL where you are and it can be quite annoying, if you have to move the cursor simply to get the URL. There are also security risk factors such as an increased danger of phishing attacks, as the user will not see the URL of a document by default and could be tricked into believing that a certain page is authentic much more easily. Mozilla Labs followed up with an experimental add-on for Firefox 4 and Firefox 5 that also aims at killing the permanent URL bar. Less Chrome HD 1 has the same effect as the hidden URL bar in Chrome, but it is displayed as soon as the cursor is moved to the top of the screen. It is a simpler solution than Google’s version: The Chrome team has redesigned the user interface with some navigation features left in the tab bar, while Mozilla removes everything with the exception of tabs. Less Chrome HD 1 also comes with a rather painful side effect that the Firefox menu cannot be opened when the browser is used in maximized view. Chrome’s URL-less interface also has problems as it lacks a search field that should be part of the tab bar. Both approaches have their advantages and both are far from perfect. Still, having played with the reduced Chrome interface, we are now convinced that this is the path browsers will take. Removing the URL bar may sound outrageous, but it is a decision that makes sense, in the end. We are clearly moving to a time where navigating the web isn’t the problem anymore. Visualizing content, especially new types of content such as specialized apps in as much space as possible is becoming more and more an issue as we are working with multiple web-enabled devices with different screen sizes. Entering the address of a web site is merely one task of many – and once you are at your destination, there is no need to permanently display the address (with the exception of security concerns, which will need to be addressed.) The additional space gained can benefit web applications that now look like they can be run in full-screen mode by default. From a user perspective this approach makes a lot of sense. Web site owners may see this differently as their URL is suddenly devalued. The URL bar has been a marketing tool which turned web addressed into brand names. When the URL bar is gone, what does it matter if your site has a .com, .tv or .biz address, as long as a search engine will find it and give you a high ranking? When the URL bar is removed, there will be another challenge for Internet marketing managers. Keep in mind, this is a matter of when, not if. There is no doubt, removing the URL bar will be most substantial change to web browsers since the release of Mosaic, the first publicly available browser. I have not talked with the IE team and I am not aware of their product plans. However, Microsoft’s is not in a position at this time to set trends. IE9 has not been gaining as much market share as Microsoft would have liked to see: According to StatCounter, IE9 is still below 5% market share, while Microsoft’s rival HTML5 browsers, Chrome 11 and Firefox 4, are at more than 16% and more than 15%, respectively. When combined, Chrome and Firefox now exceed the total market share of IE, according to StatCounter (48% vs. 45%). While Microsoft does not have to follow every trend and we hope that the company continues to innovate as well, this new UI trend is something Microsoft cannot afford to miss. With all of its UI design expertise, Microsoft may even have the ultimate solution how to clear even more space from the browser menu. 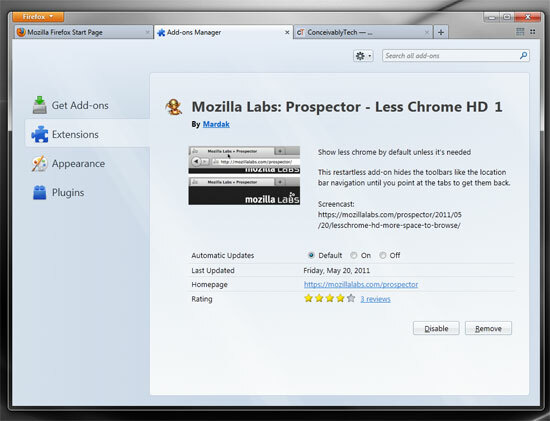 Our prediction is that all browser developers will be experimenting with the URL bar integration/deletion from the browser interface throughout this year and that all popular browsers will feature this option in 2012. The bottom line? Web browsers remain a very dynamic environment that will change frequently until the best-suited interface for an app-centric Internet is found. As long as the hidden URL feature remains optional, it is unlikely that Google and Mozilla are alienating their users with dramatic UI changes, while they keep the perception of a fresh and cutting edge browser alive. We suspect that a substantial share of Chrome and Firefox users will be playing with the reduced UI and provide Google and Mozilla feedback. Microsoft has a different user base and we know that IE users do not appreciate change as much as Chrome and Firefox users do (and expect). That may be an advantage for Microsoft in one view, but slow change will also prevent Microsoft from regaining users that have been lost to Mozilla and Google. In comparison to its rivals, the just recently released IE9 feels almost old again. Microsoft cannot lose touch with current successful trends and may have to adopt a much faster product release cycle than the currently indicated 12-month cycle (which is down from previously 24 months since IE8). Nên Cho Trẻ Học Tiếng Anh Từ Mấy Tuổi ??? Hãy liên hệ và góp ý cho chúng tôi để có thể đem lại thông tin hữu ích cho mọi người. Ngành Công Nghệ Thực Phẩm Là Gì, Có Dễ Xin Việc Không?? ?